To install simply click the file MMKbd.pkg and follow the on-screen instructions. Actually this driver just enable the behavior of the 25 multimedia keys on the Ortek/Adesso EKB-805 PRO keyboard on Mac OS X: sound mute, volume down, volume up, Play/Pause, Stop, Next Track, Previous Track, Sleep (act as the power key), eject, web, mail, sherlock and calculator. You might notice that F14 and F15 work as brightness keys, this is not featured by my driver but by the Apple drivers. The Sleep/Power key does not work as a Power On key (you cannot start up the computer from your keyboard). There is nothing I can do about it. The reason I make this file available is because I believe it can be useful for some peoples and I would like some feedback. So feel free to contact me. Note: You need Mac OS 10.2 or later in order to use this driver, it will not work with 10.1. I have an older version available upon request. 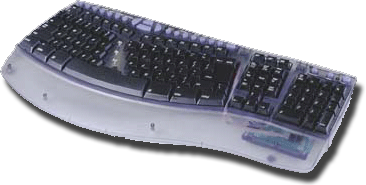 Note: on the transparent model pf1 and pf2 are considered the same key. This is because the driver sense the same keycode and I haven't found a workaround, to detect the actual key. Oh, and of course it's free.